John French won't be able to compete at the Platinum Performance/USHJA International Derby Championship on Skyhawk (pictured) and Center Court after a horse rolled on him. Photo by Laura Lemon. 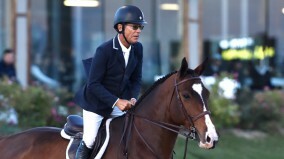 Top hunter professional John French is healing in the hospital after a horse rolled on top of him at the Showpark Racing Festival CSI**, held in Del Mar, California, on July 25. French was finishing his round when the mare he was riding tripped and rolled on his right side, breaking seven ribs, puncturing a lung and spraining his foot. The owner told French she saw her mare get her right leg stuck behind her. “Instead of tripping out in front of her, she tripped with her leg back, so it’s like she went straight down,” he said. The Paso Robles, California, professional who runs Waldenbrook Farm in Templeton, California, had just returned to the show ring after his collarbone injury. His collarbone hadn’t completely healed, but with the doctors’ permission, French got back in the saddle and was planning to compete at the Platinum Performance/USHJA International Hunter Derby Championship in Lexington, Kentucky, on Aug. 16-18 with Laura Wasserman’s Skyhawk and Hiller Farms LLC’s Center Court. Doctors were concerned about air escaping his right lung on Wednesday and considered putting in a chest tube, but it appears that his lung has little nicks instead of a puncture. And despite harming his ligaments in his right foot, French has been encouraged to walk to help with his breathing and his broken ribs. The recovery period is estimated to be about eight weeks.